Spergola and Lambrusco are two geographical areas in Scandiano, near Reggio Emilia, very famous for wine production. 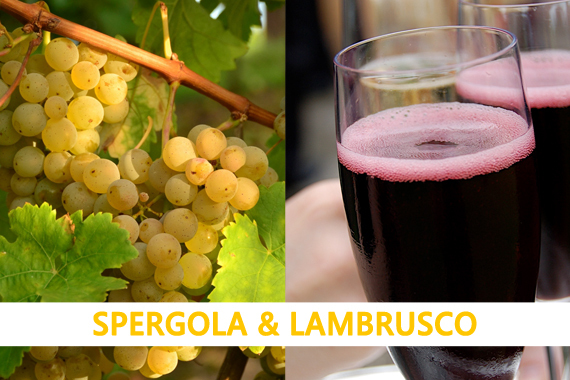 Lambrusco and Spergola are common and frequent names in the local agricultural tradition, but not only. These grapes, Spergola and Lambrusco, arise from Scandiano hills specifically and these landscapes give us the image of a very old winemaking practice. A little curiosity for Spergola: you think that even Matilde di Canossa, during one of her diplomatic maneuvers, did homage to Pope Gregory VII . The price does include: visit to a wine cellar close to Reggio Emilia; final tasting of Spergola and Lambrusco. The price does not include: transfers; overnights; anything not specifically mentioned in “The price does include”.